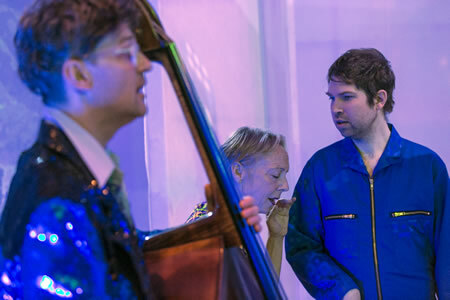 In this musical performance of the series “Close-Up”, one of the most famous and musical Thikwa artists, Tim Petersen, meets the actress and vocal performer Ruth Geiersberger as well as Klaus Janek, double bassist and composer of experimental electronic music – a well-practised and experimental trio. 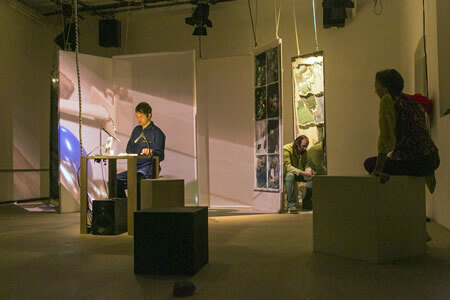 In this fast world we are living in, the pieces sets a counterpoint by producing spaces of silence and comfort, but also disonances, when the slowness hits the walls of the noisy outside. A performative sound installation with lots of singing and a humorous search for the essence of an extraordinary person. The piece premiered march 14th. Following performances were march 15th through 17, and 21st through 24th.